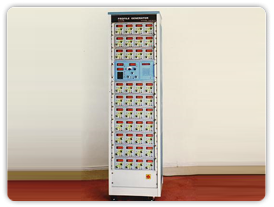 The system provides programmable 40-channel signal generator for loading and vibration analysis of aircraft wing. Used in conjunction with shaker system the generator has the capability to provide single or multichannel sinusoidal, triangular or square waveform in a programmable profile. The frequency can be swept under program control. Online data and display facility are provided. No.119, 3rd Main, East of NGEF Layout, Kasturi Nagar,Bengaluru-560043.